Is President Obama’s plan to increase exports the booster small businesses need? 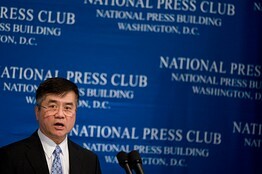 Getty Images U.S. Secretary of Commerce Gary Locke discusses the Obama administration’s plan to encourage job growth through increasing the amount of US exports. Under the program, the government hopes to strengthen U.S. efforts to promote exports from small businesses, help enforce free-trade agreements with other nations, and work toward eliminating barriers to sales of U.S. products. Leaders from various government agencies including the Department of Commerce, the Treasury Department, the State Department, the Small Business Administration, and the U.S. Trade Representative will also be required to form a so-called Export Promotion Cabinet that will submit a detailed plan to the president about how they will collectively enhance U.S. exports. In addition, the president has called upon the Export-Import Bank—an independent institution that provides financing to U.S. companies when private banks won’t—to increase its financing activities to small- and medium-sized businesses from $4 billion to $6 billion over the next year. The funds that President Obama has proposed to support these initiatives are meager in comparison to the raft of new small-business aid programs that were included in the president’s $3.8 trillion budget. For example, he is budgeting an additional $54 million for the Department of Agriculture and an extra $78 million for the International Trade Administration. Yet some economists still say this initiative, depending on how it’s enacted, may be one of the president’s better ideas for creating jobs. During the downturn, small business owners’ number one complaint has been their ability (or inability) to reach their sales goals, says Bill Dunkelberg, chief economist for the National Federation of Independent Business in Washington. Less than 1% of companies expected to increase sales in January, down from 1% a month earlier, according to the NFIB’s latest “Small Business Trends” survey. Helping U.S. companies export doesn’t just make sense financially for those firms, it could also boost jobs—especially in the manufacturing sector, he says. Seconding that assessment is Thomas J. Prusa, an economics professor at Rutgers University. “For me, this is a policy that [could] create permanent (or long-term) improvement in the competitive position of U.S. businesses—and, in turn, [create] U.S. jobs,” he says. Further, if the dollar continues to weaken, which it has in recent months, “U.S. firms should be able to compete better in foreign markets,” Prusa says. Still, this initiative won’t be easy. Less than 1% of the country’s 30 million companies export, according to Locke. Even fewer small companies do so, says Dunkelberg. Plus, there are very real barriers associated with international trade. Among them: currency exchange, cross-border tax differences and language barriers often inhibit a more vibrant export market. Given these constraints, some small business owners are skeptical about the president’s plan to boost exports. “The only thing you can really expect from the government on the level that Obama is talking about is introducing parties,” says Scott Layman, a co-owner of Zyvax, a specialty chemicals supplier in Ellijay, Ga. “If anything, the countries where the government has injected itself the most—[North American Free Trade Agreement or] NAFTA countries—are the hardest places for us to export to,” says Layman, whose company now exports to roughly 100 countries. For the NEI to run optimally, it would have to work in lock-step with programs like the president’s $30 billion small-business lending program, says Josh Lerner, an investment banking professor at Harvard Business. The reason? Lining up letters of credit and financing receivables is vital in exporting, he says. Under this program, which will be available to banks with assets under $10 billion, banks that increase lending to small businesses beyond 2009 levels may be required to pay reduced dividends owed to the Treasury Department. “The most important role the government could play in boosting exports is to help overcome financing constraints,” says Lerner. “Credit is the thing that makes trade grow; without this business lags or currency differences often confound foreign trade,” he says. Brian Burt, the chief financial officer of Hardwoods of Michigan, a small flooring supply company in Clinton, Mich., says the risk involved with exporting is his biggest issue. Not only is there potential for getting stiffed and having no legal recourse, the time it takes to receive payment from foreign customers is lengthy. Typically, payments in the flooring industry clear in 30 days. For foreign customers, payments generally take 70 to 90 days, he says. “We manage our inventories well but couldn’t afford to have many more of our sales come in at 90 days,” says Burt. That said, if the president’s new plan does in fact help boost his company’s exports from roughly 5% or 10% to 20% or 30%, “we would definitely be adding people on,” he says.